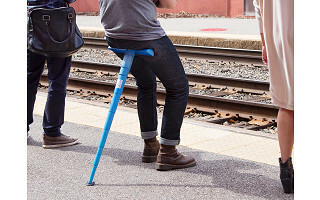 This telescope-like contraption is actually a handy, portable stool. You can turn any waiting situation into a sitting one. Sitpack folds down to a tall, cup-sized capsule you can slip into a purse or backpack and opens to T-shaped surface you can lean on. Anywhere. Rest at concerts, sporting events, or while in a long line. Because your legs stay extended, Sitpack is better for their circulation than your average chair. While at a music festival, Denmark-based Maker Jonas Lind-Bendixen waited three hours for Prince to go on stage and then noticed thousands of chairs left behind. He wanted to create a seat—no bigger than a beverage can—that people could travel with. When you’re ready to rest, adjust the height until it’s just right. The rubber grip at the bottom keeps you steady whether you’re watching a game outdoors, waiting for the bus, or giving your legs a break at a standing desk. Hello everyone! I'm proud to introduce Sitpack to The Grommet. I'd be happy to answer any questions you have! For a tutorial on how to use Sitpack, check out this video. @Mike --any weight restrictions? Also how much does Sitpack weigh? It holds 220 lbs and it is 1.25 lbs itself. @Mike -- make one that handles 300 and i'll buy several. @Jonas I'm with Stu, sounds great if it held my weight. @Erin Hi Erin, we set the limit to 100Kg/220Lbs that is - from the seat up. If a person weighs 110 kg. it would still hold. Hi Jonas! I sure could have used this while waiting to get into Prince's Paisley Park parties! I am thinking of getting a few of these so anyone coming with me to events can use one. What is the maximum body weight these can handle? I am a little concerned that someone weaving through a crowd behind me might trip on it or kick it out from under me, but I am willing to try it. Thanks! @Nichole Hi Nicole, thanks you for the comment. Sitpack is even more awesome to use as a crowd. A friend of mine i 130Kg/286 lbs and he use it, has so for about one year. We recommend max: 220Lbs.. I have been using it a few indoor and outdoor music events and no body tripped yet. It also depends on how much you lean on it - the more lean the more it "pokes" out into the crowd. But with a blue on people will notice and walk around it. Thanks again. @Jonas Wait a minute--you jumped right over Nichole's hanging out with Prince life experience. Yowzer! How lucky for you @nichole. I recently toured Paisley Park with Katherine Klinger, a long time Grommet team member in the twin cities. What an experience those parties must have been. @Jonas Is it made of plastic, fiberglass or what? About my concern about others tripping on the Sitpack behind me...would you consider making in in a yellow or white color? I am wondering if there's a a way to put reflective tape on any of the sections. Is there any space to do that without jamming the telescoping sections? @Nichole Hi Nicole, I have been using it a few indoor and outdoor music events and no body tripped yet. It also depends on how much you lean on it - the more lean the more it "pokes" out into the crowd. For the reflective tape it would be possible, at the lower part of the tubes. The tubes are "conical" shaped making a few millimeter space at the end of the tube. Or else, orange markers could do the trick. Good point for further development, and for the other colors - grommet is looking into adding to the color scheme. @Jonas Is it paint-able? Could you paint the sections in a bright, acrylic paint to enhance visibility in a crowd? 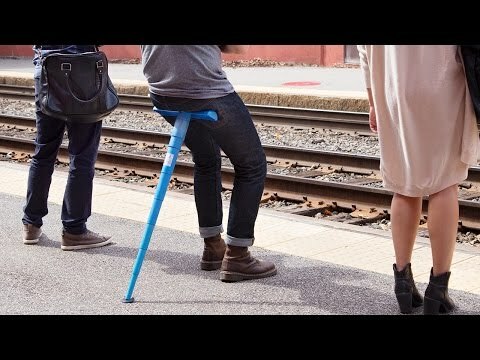 This is just a suggestion... Add a loop to one seat end so that when it's closed, it can be carried around the wrist without actually having to hold onto it. Having my hands free is always important and would really put this over the top for me. I love it regardless and am thinking about purchasing. @Teresa Hi Teresa - awesome suggestion! We have developed something alike, but not been able to put it into production jut yet. At most camera stores you could get a wrist strap that would fit perfect in the two holes located at end of each seat. Thanks again for the suggestion, much appreciated. This would be absolutely perfect for senior citizen outings and also tours like we have been on through Road Scholar. Standing still for us is harder than actual walking sometimes. I am buying two for my husband and me. @Nancy Hi Nancy, sound great. So true, Sitpacks is a great tool to replenish batteries instead of getting tired from standing. :) Thanks a lot for the comment. Looks like an accident waiting to happen . If someone walking behind you hit against it . Boom down you go . I also noticed the two people sitting and talking on it limited their hand gestures as if they might lose their balance if they got very animated with their hands . Not for me . @Paula HI Paula thank you for the comment - even when using it on a crowded platform in NYC i did not have that issue. Its not poking out that much, and as you are not sitting full on, but leaning chances are you will not fall. Also the rubber stopper is super efficient and the leg is sturdy, so its not easily pushed away. Of course a user has balance problems, leaning on a stick is not for them :) But with a legs at a good angle, balance is really not a problem as you are more standing that sitting. Sitpack is the highest foldable (onelegged) seat on the market. Thanks again for the comment. Will it work for someone just under 5 feet tall? Thanks, Robin. How comfortable is the seat? does it have any padding? Jonas: Looks great, but... I would love it, if it were also a walking stick. I travel a lot, am 63 and have a lot of replaced joints. I carry a collapsable walking stick all around the world. Would love it if it included a seat. Just a thought. Great idea! Maybe if you made the seat/capsule section covered with foam, or gel then you could also use it as a "pillow" when folded and not in use (like if you're on a subway or bus leaning against the window- Also this would make sitting a bit more comfy too! @Wendy Awesome idea Wendy, we will keep that in mind for further development. We do have a seat cushion/carry-case, but we could forsure make it more comfy. Thank you for the input! I love this, but I'm a short stature person with bad knees and hate having to stand in long lines! Will you be making this for people that are 5 ft tall? Or can your product be adjusted for a shorter person? I can see elderly people who are often very short and would benefit from something like this! @Marta . Hi Marta - thank you for you positivity. Sitpack is adjustable in 11 cm. increments and if one increment slightly to high, simply adjust the angle of the pole. Remember to adjust it from the top down according to the userguide. It great for elderly people that are mobile and does not have balance issues :) Thanks again. Hi, very interesting! I have two questions that I did not find here. How comfortable is it? Does the 1% silicone soften the plastic enough to act as a cushion at all? Are the rubber stoppers replacable if they wear out or are damaged? @Jonas Hi David, great questions. Its comfortable for 15-30 minutes with some regular movement, like when sitting on a chair, we move about every couple of minutes as a reflex to redistribute weight. I normally use it at my high desk for 10-15 minutes - stand for 30-60 minutes, and use it again. Keeps me focused, and non-slouching... The silicone is added to make the extending and retracting smooth like a air-pump, it works as a lubricant that "ooze" out continuously with using it. Yes the rubber stopper can be changed - it needs to be twisted slowly out and back in. It cannot be pushed or shoved as it is Anti-slip rubber :) Thank you for the question. Short vid. on twisting the foot back in. You said that approx. 60% of your body weight is on it when it's used. Does the 220 lbs max that you mention represent the 60% that's supported (60% of 366 lbs = ~220 lbs) by the Sitpack or the max total body weight, of which the Sitpack will support 60% (132 lbs) i.e. I'm 6'2" and 295 but 60% of that is only 177, so will this support me safely or not? @Jonas Hi Jan, good question. My friend is 280lbs and he use it. But we recommend 220 lbs.With higher weight you just have to be careful not to lean to the sides as the seat is reacts to skewed weight distribution. Leaning at 6'2 is a great height. Hope that answers your question. Is it high enough to be comfortable for taller people (e.g. 6'2"), so that they can comfortably lean against it or is it more for shorter people, such that taller people would be more sitting than leaning? @Jan Hi Jan, 6'2is a great height - 6´4/6 and up would not be leaning but sitting and not what Sitpack is intended for and would not be to comfy in the longrun. Does Sitpack have a weight specificafion? @Ron Hi Ron - It holds 220 lbs and it is 1.25 lbs itself. What is the weight limit for the sitpack? @LaRonda . Hi LaRonda - It holds 220 lbs and it is 1.25 lbs itself. @Jonas Gosh, it would be nice if people bothered to read the earlier questions and comments before posting the exact same question a dozen times! This was asked and answered by 10:30am! @Mike Hey Mike and Beverley, How about instead of complaining about everyone asking the same question, you include this information in your product description. It's baffling to note that while selling a product of this type that you do not already provide this critical information. Regards. @Mike Thanks for the info. Just for your information, none of this can be found on my Grommet page. At least I don't see it anywhere. Cool product. Regards. No problem. To see further details on any Grommet, just click on the photos underneath the video. Hi Jonas, cool product. Have you had any negative experiences using this at events such as golf tournaments? I worry a bit about security thinking this could be used as a weapon, since it extends so much. Is there a maximum weight for using the Sitpack? What kind of locking mechanism is used to keep telescope from collapsing? Trying to understand from safety point is each section lock? Also how the seat stays in position. Please explain. Bike seat poles have shock dampening types maybe u could somehow incorporate that idea into top section for more confort? 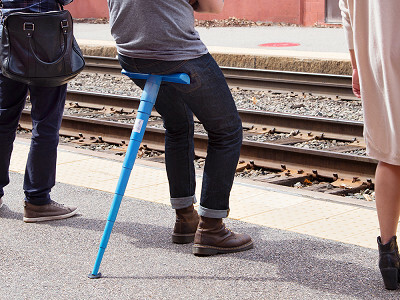 This telescope-like contraption is actually a handy, portable stool. You can turn any waiting situation into a sitting one. Sitpack folds down to a tall, cup-sized capsule you can slip into a purse or backpack and opens to T-shaped surface you can lean on. Anywhere. Rest at concerts, sporting events, or while in a long line. Because your legs stay extended, Sitpack is better for their circulation than your average chair. While at a music festival, Denmark-based Maker Jonas Lind-Bendixen waited three hours for Prince to go on stage and then noticed thousands of chairs left behind. He wanted to create a seat—no bigger than a beverage can—that people could travel with.